Black top hat extract local minima that are larger than the structuring element. Gaëtan Lehmann. Biologie du Développement et de la Reproduction, INRA of Jouy-en-Josas, France. Definition at line 46 of file itkBlackTopHatImageFilter.h. Definition at line 48 of file itkOptBlackTopHatImageFilter.h. Definition at line 54 of file itkBlackTopHatImageFilter.h. Reimplemented in itk::GrayscaleDilateImageFilter< TInputImage, TOutputImage, TKernel >, itk::GrayscaleErodeImageFilter< TInputImage, TOutputImage, TKernel >, itk::GrayscaleMorphologicalClosingImageFilter< TInputImage, TOutputImage, TKernel >, itk::GrayscaleMorphologicalOpeningImageFilter< TInputImage, TOutputImage, TKernel >, and itk::MorphologicalGradientImageFilter< TInputImage, TOutputImage, TKernel >. Definition at line 78 of file itkKernelImageFilter.h. Reimplemented from itk::BoxImageFilter< TInputImage, TOutputImage >. 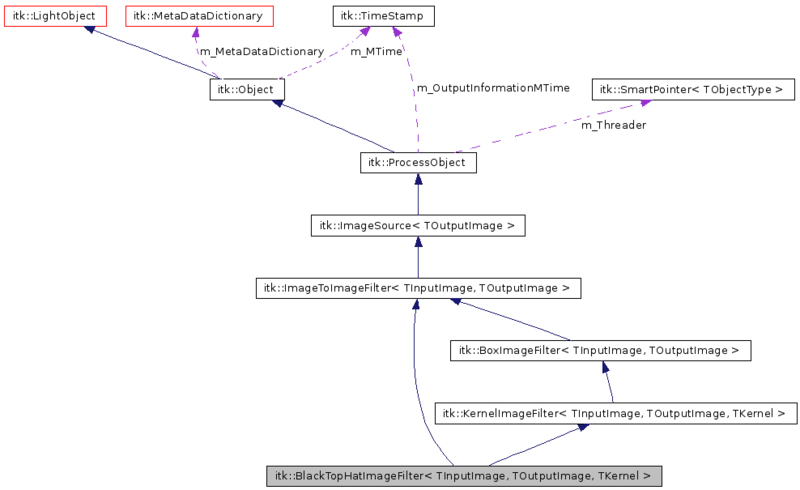 Reimplemented in itk::BinaryDilateImageFilter< TInputImage, TOutputImage, TKernel >, itk::BinaryErodeImageFilter< TInputImage, TOutputImage, TKernel >, itk::BinaryMorphologyImageFilter< TInputImage, TOutputImage, TKernel >, itk::MorphologyImageFilter< TInputImage, TOutputImage, TKernel >, itk::MaskedMovingHistogramImageFilter< TInputImage, TMaskImage, TOutputImage, TKernel, THistogram >, itk::MaskedRankImageFilter< TInputImage, TMaskImage, TOutputImage, TKernel >, itk::MovingHistogramDilateImageFilter< TInputImage, TOutputImage, TKernel >, itk::MovingHistogramErodeImageFilter< TInputImage, TOutputImage, TKernel >, itk::MovingHistogramImageFilter< TInputImage, TOutputImage, TKernel, THistogram >, itk::MovingHistogramImageFilterBase< TInputImage, TOutputImage, TKernel >, itk::MovingHistogramMorphologicalGradientImageFilter< TInputImage, TOutputImage, TKernel >, itk::MovingHistogramMorphologyImageFilter< TInputImage, TOutputImage, TKernel, THistogram >, itk::BinaryMorphologyImageFilter< TInputImage, TOutputImage, TKernel >, itk::GrayscaleDilateImageFilter< TInputImage, TOutputImage, TKernel >, itk::GrayscaleErodeImageFilter< TInputImage, TOutputImage, TKernel >, itk::GrayscaleMorphologicalClosingImageFilter< TInputImage, TOutputImage, TKernel >, itk::GrayscaleMorphologicalOpeningImageFilter< TInputImage, TOutputImage, TKernel >, itk::MorphologicalGradientImageFilter< TInputImage, TOutputImage, TKernel >, itk::MorphologyImageFilter< TInputImage, TOutputImage, TKernel >, itk::RankImageFilter< TInputImage, TOutputImage, TKernel >, itk::MaskedMovingHistogramImageFilter< TInputImage, TMaskImage, TOutputImage, TKernel, itk::MaskedRankHistogram< TInputImage::PixelType > >, itk::MovingHistogramImageFilter< TInputImage, TOutputImage, TKernel, itk::Function::MorphologicalGradientHistogram< TInputImage::PixelType > >, itk::MovingHistogramImageFilter< TInputImage, TOutputImage, TKernel, itk::Function::MorphologyHistogram< TInputImage::PixelType, std::less< TInputImage::TInputImage::PixelType > > >, itk::MovingHistogramImageFilter< TInputImage, TOutputImage, TKernel, itk::Function::MorphologyHistogram< TInputImage::PixelType, std::greater< TInputImage::TInputImage::PixelType > > >, itk::MovingHistogramImageFilter< TInputImage, TOutputImage, TKernel, itk::RankHistogram< TInputImage::PixelType > >, itk::MovingHistogramMorphologyImageFilter< TInputImage, TOutputImage, TKernel, itk::Function::MorphologyHistogram< TInputImage::PixelType, std::less< TInputImage::TInputImage::PixelType > > >, and itk::MovingHistogramMorphologyImageFilter< TInputImage, TOutputImage, TKernel, itk::Function::MorphologyHistogram< TInputImage::PixelType, std::greater< TInputImage::TInputImage::PixelType > > >. Definition at line 62 of file itkKernelImageFilter.h. Definition at line 54 of file itkOptBlackTopHatImageFilter.h. Definition at line 59 of file itkBlackTopHatImageFilter.h. Definition at line 56 of file itkOptBlackTopHatImageFilter.h. Definition at line 61 of file itkBlackTopHatImageFilter.h. Definition at line 53 of file itkOptBlackTopHatImageFilter.h. Definition at line 58 of file itkBlackTopHatImageFilter.h. Definition at line 55 of file itkOptBlackTopHatImageFilter.h. Definition at line 60 of file itkBlackTopHatImageFilter.h. Definition at line 51 of file itkOptBlackTopHatImageFilter.h. Definition at line 57 of file itkBlackTopHatImageFilter.h. Reimplemented in itk::BinaryDilateImageFilter< TInputImage, TOutputImage, TKernel >, itk::BinaryErodeImageFilter< TInputImage, TOutputImage, TKernel >, itk::BinaryMorphologyImageFilter< TInputImage, TOutputImage, TKernel >, itk::MaskedMovingHistogramImageFilter< TInputImage, TMaskImage, TOutputImage, TKernel, THistogram >, itk::MaskedRankImageFilter< TInputImage, TMaskImage, TOutputImage, TKernel >, itk::BinaryMorphologyImageFilter< TInputImage, TOutputImage, TKernel >, itk::RankImageFilter< TInputImage, TOutputImage, TKernel >, and itk::MaskedMovingHistogramImageFilter< TInputImage, TMaskImage, TOutputImage, TKernel, itk::MaskedRankHistogram< TInputImage::PixelType > >. Definition at line 65 of file itkKernelImageFilter.h. Definition at line 63 of file itkOptBlackTopHatImageFilter.h. Definition at line 70 of file itkBlackTopHatImageFilter.h. Reimplemented in itk::BinaryDilateImageFilter< TInputImage, TOutputImage, TKernel >, itk::BinaryErodeImageFilter< TInputImage, TOutputImage, TKernel >, itk::BinaryMorphologyImageFilter< TInputImage, TOutputImage, TKernel >, itk::MaskedMovingHistogramImageFilter< TInputImage, TMaskImage, TOutputImage, TKernel, THistogram >, itk::MaskedRankImageFilter< TInputImage, TMaskImage, TOutputImage, TKernel >, itk::MovingHistogramDilateImageFilter< TInputImage, TOutputImage, TKernel >, itk::MovingHistogramErodeImageFilter< TInputImage, TOutputImage, TKernel >, itk::MovingHistogramImageFilter< TInputImage, TOutputImage, TKernel, THistogram >, itk::MovingHistogramImageFilterBase< TInputImage, TOutputImage, TKernel >, itk::MovingHistogramMorphologicalGradientImageFilter< TInputImage, TOutputImage, TKernel >, itk::MovingHistogramMorphologyImageFilter< TInputImage, TOutputImage, TKernel, THistogram >, itk::BinaryMorphologyImageFilter< TInputImage, TOutputImage, TKernel >, itk::GrayscaleDilateImageFilter< TInputImage, TOutputImage, TKernel >, itk::GrayscaleErodeImageFilter< TInputImage, TOutputImage, TKernel >, itk::GrayscaleMorphologicalClosingImageFilter< TInputImage, TOutputImage, TKernel >, itk::GrayscaleMorphologicalOpeningImageFilter< TInputImage, TOutputImage, TKernel >, itk::MorphologicalGradientImageFilter< TInputImage, TOutputImage, TKernel >, itk::RankImageFilter< TInputImage, TOutputImage, TKernel >, itk::MaskedMovingHistogramImageFilter< TInputImage, TMaskImage, TOutputImage, TKernel, itk::MaskedRankHistogram< TInputImage::PixelType > >, itk::MovingHistogramImageFilter< TInputImage, TOutputImage, TKernel, itk::Function::MorphologicalGradientHistogram< TInputImage::PixelType > >, itk::MovingHistogramImageFilter< TInputImage, TOutputImage, TKernel, itk::Function::MorphologyHistogram< TInputImage::PixelType, std::less< TInputImage::TInputImage::PixelType > > >, itk::MovingHistogramImageFilter< TInputImage, TOutputImage, TKernel, itk::Function::MorphologyHistogram< TInputImage::PixelType, std::greater< TInputImage::TInputImage::PixelType > > >, itk::MovingHistogramImageFilter< TInputImage, TOutputImage, TKernel, itk::RankHistogram< TInputImage::PixelType > >, itk::MovingHistogramMorphologyImageFilter< TInputImage, TOutputImage, TKernel, itk::Function::MorphologyHistogram< TInputImage::PixelType, std::less< TInputImage::TInputImage::PixelType > > >, and itk::MovingHistogramMorphologyImageFilter< TInputImage, TOutputImage, TKernel, itk::Function::MorphologyHistogram< TInputImage::PixelType, std::greater< TInputImage::TInputImage::PixelType > > >. Definition at line 63 of file itkKernelImageFilter.h. Definition at line 58 of file itkOptBlackTopHatImageFilter.h. Definition at line 65 of file itkBlackTopHatImageFilter.h. Definition at line 60 of file itkOptBlackTopHatImageFilter.h. Definition at line 67 of file itkBlackTopHatImageFilter.h. Definition at line 57 of file itkOptBlackTopHatImageFilter.h. Definition at line 64 of file itkBlackTopHatImageFilter.h. Definition at line 59 of file itkOptBlackTopHatImageFilter.h. Definition at line 66 of file itkBlackTopHatImageFilter.h. Definition at line 52 of file itkOptBlackTopHatImageFilter.h. Definition at line 63 of file itkBlackTopHatImageFilter.h. Reimplemented in itk::BinaryDilateImageFilter< TInputImage, TOutputImage, TKernel >, itk::BinaryErodeImageFilter< TInputImage, TOutputImage, TKernel >, itk::BinaryMorphologyImageFilter< TInputImage, TOutputImage, TKernel >, itk::MaskedMovingHistogramImageFilter< TInputImage, TMaskImage, TOutputImage, TKernel, THistogram >, itk::MaskedRankImageFilter< TInputImage, TMaskImage, TOutputImage, TKernel >, itk::MovingHistogramDilateImageFilter< TInputImage, TOutputImage, TKernel >, itk::MovingHistogramErodeImageFilter< TInputImage, TOutputImage, TKernel >, itk::MovingHistogramImageFilter< TInputImage, TOutputImage, TKernel, THistogram >, itk::MovingHistogramImageFilterBase< TInputImage, TOutputImage, TKernel >, itk::MovingHistogramMorphologicalGradientImageFilter< TInputImage, TOutputImage, TKernel >, itk::MovingHistogramMorphologyImageFilter< TInputImage, TOutputImage, TKernel, THistogram >, itk::BinaryMorphologyImageFilter< TInputImage, TOutputImage, TKernel >, itk::RankImageFilter< TInputImage, TOutputImage, TKernel >, itk::MaskedMovingHistogramImageFilter< TInputImage, TMaskImage, TOutputImage, TKernel, itk::MaskedRankHistogram< TInputImage::PixelType > >, itk::MovingHistogramImageFilter< TInputImage, TOutputImage, TKernel, itk::Function::MorphologicalGradientHistogram< TInputImage::PixelType > >, itk::MovingHistogramImageFilter< TInputImage, TOutputImage, TKernel, itk::Function::MorphologyHistogram< TInputImage::PixelType, std::less< TInputImage::TInputImage::PixelType > > >, itk::MovingHistogramImageFilter< TInputImage, TOutputImage, TKernel, itk::Function::MorphologyHistogram< TInputImage::PixelType, std::greater< TInputImage::TInputImage::PixelType > > >, itk::MovingHistogramImageFilter< TInputImage, TOutputImage, TKernel, itk::RankHistogram< TInputImage::PixelType > >, itk::MovingHistogramMorphologyImageFilter< TInputImage, TOutputImage, TKernel, itk::Function::MorphologyHistogram< TInputImage::PixelType, std::less< TInputImage::TInputImage::PixelType > > >, and itk::MovingHistogramMorphologyImageFilter< TInputImage, TOutputImage, TKernel, itk::Function::MorphologyHistogram< TInputImage::PixelType, std::greater< TInputImage::TInputImage::PixelType > > >. Definition at line 68 of file itkKernelImageFilter.h. Definition at line 47 of file itkOptBlackTopHatImageFilter.h. Definition at line 53 of file itkBlackTopHatImageFilter.h. Reimplemented in itk::MorphologyImageFilter< TInputImage, TOutputImage, TKernel >, itk::MaskedMovingHistogramImageFilter< TInputImage, TMaskImage, TOutputImage, TKernel, THistogram >, itk::MaskedRankImageFilter< TInputImage, TMaskImage, TOutputImage, TKernel >, itk::MovingHistogramImageFilter< TInputImage, TOutputImage, TKernel, THistogram >, itk::MovingHistogramImageFilterBase< TInputImage, TOutputImage, TKernel >, itk::MovingHistogramMorphologyImageFilter< TInputImage, TOutputImage, TKernel, THistogram >, itk::MorphologyImageFilter< TInputImage, TOutputImage, TKernel >, itk::RankImageFilter< TInputImage, TOutputImage, TKernel >, itk::MaskedMovingHistogramImageFilter< TInputImage, TMaskImage, TOutputImage, TKernel, itk::MaskedRankHistogram< TInputImage::PixelType > >, itk::MovingHistogramImageFilter< TInputImage, TOutputImage, TKernel, itk::Function::MorphologicalGradientHistogram< TInputImage::PixelType > >, itk::MovingHistogramImageFilter< TInputImage, TOutputImage, TKernel, itk::Function::MorphologyHistogram< TInputImage::PixelType, std::less< TInputImage::TInputImage::PixelType > > >, itk::MovingHistogramImageFilter< TInputImage, TOutputImage, TKernel, itk::Function::MorphologyHistogram< TInputImage::PixelType, std::greater< TInputImage::TInputImage::PixelType > > >, itk::MovingHistogramImageFilter< TInputImage, TOutputImage, TKernel, itk::RankHistogram< TInputImage::PixelType > >, itk::MovingHistogramMorphologyImageFilter< TInputImage, TOutputImage, TKernel, itk::Function::MorphologyHistogram< TInputImage::PixelType, std::less< TInputImage::TInputImage::PixelType > > >, and itk::MovingHistogramMorphologyImageFilter< TInputImage, TOutputImage, TKernel, itk::Function::MorphologyHistogram< TInputImage::PixelType, std::greater< TInputImage::TInputImage::PixelType > > >. Definition at line 81 of file itkKernelImageFilter.h. Reimplemented in itk::MorphologyImageFilter< TInputImage, TOutputImage, TKernel >, itk::MaskedMovingHistogramImageFilter< TInputImage, TMaskImage, TOutputImage, TKernel, THistogram >, itk::MaskedRankImageFilter< TInputImage, TMaskImage, TOutputImage, TKernel >, itk::MovingHistogramDilateImageFilter< TInputImage, TOutputImage, TKernel >, itk::MovingHistogramErodeImageFilter< TInputImage, TOutputImage, TKernel >, itk::MovingHistogramImageFilter< TInputImage, TOutputImage, TKernel, THistogram >, itk::MovingHistogramImageFilterBase< TInputImage, TOutputImage, TKernel >, itk::MovingHistogramMorphologicalGradientImageFilter< TInputImage, TOutputImage, TKernel >, itk::MovingHistogramMorphologyImageFilter< TInputImage, TOutputImage, TKernel, THistogram >, itk::GrayscaleDilateImageFilter< TInputImage, TOutputImage, TKernel >, itk::GrayscaleErodeImageFilter< TInputImage, TOutputImage, TKernel >, itk::GrayscaleMorphologicalClosingImageFilter< TInputImage, TOutputImage, TKernel >, itk::GrayscaleMorphologicalOpeningImageFilter< TInputImage, TOutputImage, TKernel >, itk::MorphologicalGradientImageFilter< TInputImage, TOutputImage, TKernel >, itk::MorphologyImageFilter< TInputImage, TOutputImage, TKernel >, itk::RankImageFilter< TInputImage, TOutputImage, TKernel >, itk::MaskedMovingHistogramImageFilter< TInputImage, TMaskImage, TOutputImage, TKernel, itk::MaskedRankHistogram< TInputImage::PixelType > >, itk::MovingHistogramImageFilter< TInputImage, TOutputImage, TKernel, itk::Function::MorphologicalGradientHistogram< TInputImage::PixelType > >, itk::MovingHistogramImageFilter< TInputImage, TOutputImage, TKernel, itk::Function::MorphologyHistogram< TInputImage::PixelType, std::less< TInputImage::TInputImage::PixelType > > >, itk::MovingHistogramImageFilter< TInputImage, TOutputImage, TKernel, itk::Function::MorphologyHistogram< TInputImage::PixelType, std::greater< TInputImage::TInputImage::PixelType > > >, itk::MovingHistogramImageFilter< TInputImage, TOutputImage, TKernel, itk::RankHistogram< TInputImage::PixelType > >, itk::MovingHistogramMorphologyImageFilter< TInputImage, TOutputImage, TKernel, itk::Function::MorphologyHistogram< TInputImage::PixelType, std::less< TInputImage::TInputImage::PixelType > > >, and itk::MovingHistogramMorphologyImageFilter< TInputImage, TOutputImage, TKernel, itk::Function::MorphologyHistogram< TInputImage::PixelType, std::greater< TInputImage::TInputImage::PixelType > > >. Definition at line 60 of file itkKernelImageFilter.h. Definition at line 45 of file itkOptBlackTopHatImageFilter.h. Definition at line 51 of file itkBlackTopHatImageFilter.h. Definition at line 61 of file itkKernelImageFilter.h. Definition at line 46 of file itkOptBlackTopHatImageFilter.h. Definition at line 52 of file itkBlackTopHatImageFilter.h. Definition at line 87 of file itkOptBlackTopHatImageFilter.h. Definition at line 94 of file itkBlackTopHatImageFilter.h. Definition at line 105 of file itkOptBlackTopHatImageFilter.h. BlackTopHatImageFilter will produce the entire output. BlackTopHatImageFilter needs the entire input be available. Thus, it needs to provide an implementation of GenerateInputRequestedRegion(). Get the kernel (structuring element). Reimplemented in itk::AdaptiveHistogramEqualizationImageFilter< TImageType >, itk::MeanImageFilter< TInputImage, TOutputImage >, itk::MedianImageFilter< TInputImage, TOutputImage >, itk::NoiseImageFilter< TInputImage, TOutputImage >, and itk::SimpleContourExtractorImageFilter< TInputImage, TOutputImage >. 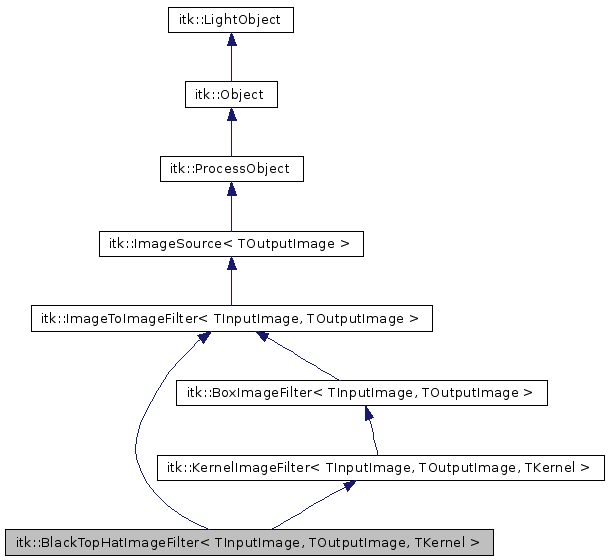 Reimplemented in itk::BinaryMorphologyImageFilter< TInputImage, TOutputImage, TKernel >, itk::MovingHistogramImageFilterBase< TInputImage, TOutputImage, TKernel >, itk::BinaryMorphologyImageFilter< TInputImage, TOutputImage, TKernel >, itk::GrayscaleDilateImageFilter< TInputImage, TOutputImage, TKernel >, itk::GrayscaleErodeImageFilter< TInputImage, TOutputImage, TKernel >, itk::GrayscaleMorphologicalClosingImageFilter< TInputImage, TOutputImage, TKernel >, itk::GrayscaleMorphologicalOpeningImageFilter< TInputImage, TOutputImage, TKernel >, and itk::MorphologicalGradientImageFilter< TInputImage, TOutputImage, TKernel >. Definition at line 90 of file itkKernelImageFilter.h. Set the kernel to a box kernel of given radius.